Friday night, I went to a Miki Doras concert. The drummer, Lars Merseburg, is a close friend of mine. And I also knew Ben Selby, the singer. Both Lars and Ben are surfers, and swim teachers at Imagine Swimming. This was my first time going to a club to see a live band, and I was allowed in because Lars explained I would be there with my parents filming for Booker Travels. I had heard a couple of their songs on myspace, and I had imagined what the concert would be like however, it was better than I expected. The music was great, there was a large crowd, the stage was low, and the whole thing had a relaxed feel. 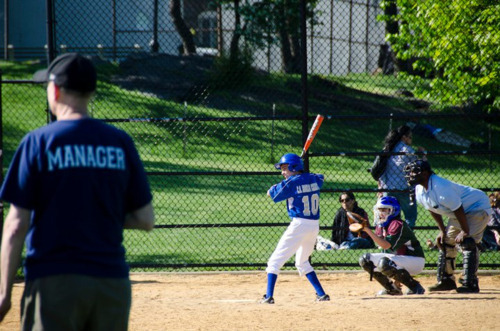 The baseball season has started and today my team played a double header in Central Park. It was a perfect and beautiful day. We won both games! The sky was bright blue, and my mother was there- watching me play. Happy Mother’s Day mom!